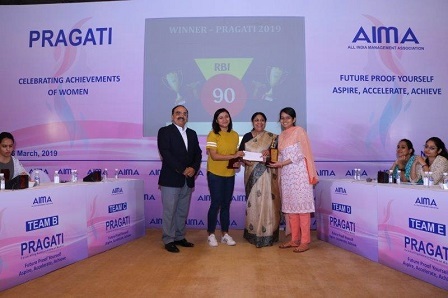 AIMA held its 7th Pragati - Celebrating Achievements of Women on 26th March 2019 on the theme "Future Proof Yourself - Aspire, Accelerate, Achieve " at New Delhi followed by a special women quiz. Mr D Shivakumar, Group Executive President, Strategy and Business Development, Aditya Birla Group was the Chief Guest and Ms Catherine Wolfram, Acting Associate Dean for Academic Affairs & Cora Jane Flood Professor of Business Administration at Haas School of Business, University of California Berkeley was the Guest of Honour for the conference. Ms Veena Swarup, Former Director - HR, EIL was the Conference Chairperson. The introductory remarks were delivered by Ms Rekha Sethi, Director General, AIMA and Mr Neeraj Kapoor, Director, AIMA delivered the concluding remarks. 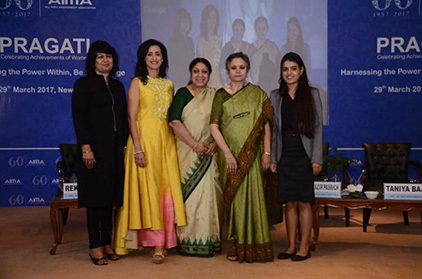 Some of the other speakers who attended the Conference included Ms Monisha Chowla, Co-Founder, IKIGAI Communications, Ms Varija Bajaj, Director, Varija Lifestyles, Kirti Poonia, Head, OKHAI, Ms Meghna Arora, Airline Captain and Flight Instructor, Ms Diya Malhotra, Associate Director - Talent, Fidelity International, Ms Nina Chatrath, Founder, Enhance Consulting, Colonel Naveen Nijhawan, OSD, Policy Planning and Research Division, Ministry of External Affairs, Ms Sampada Inamdar, Dean, Anand Corporate University, Ms Kandla Nijhowne, Celebrity Chef, Ms Payal Kumar, Professor Chair (HR/OB), Head, Research and International Collaborations, School of Management, BML Munjal University, Ms Sanchita Biswas, Customer Services & Operations, Head of Expertise & Solution Centre, Head of Emerging Technology & Solution Incubation Centre, Orange Business Services. 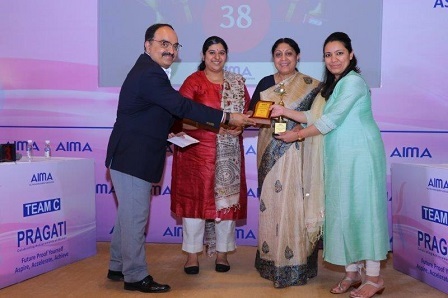 The AIMA's special women quiz was conducted by the quiz master Mr Ajay Poonia. Reserve Bank of India was declared as the Champion, followed by Airport Authority of India as the 1st Runners-up and Express Minds as the 2nd Runners-up. 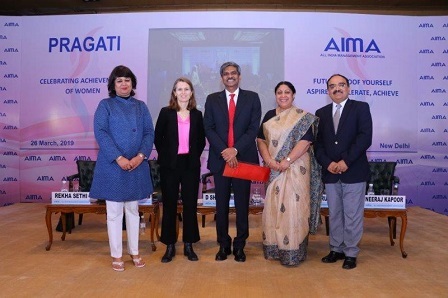 AIMA held its 6th Pragati – Celebrating Achievements of Women on 22nd March 2018 on the theme "Making Disruption your Opportunity: Navigate for Success " at New Delhi followed by a special women quiz. 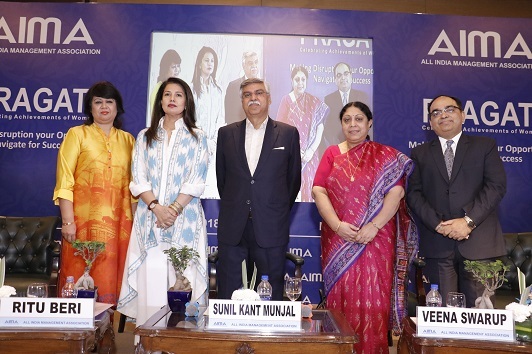 Mr Sunil Kant Munjal, Immediate Past President AIMA & Chairman, The Hero Enterprise was the chief Guest and the special address was delivered by Ms Ritu Beri, International Fashion Designer, MD & CEO, Ritu Beri Design Pvt Ltd. Ms Veena Swarup was the Conference Chairperson. The introductory remarks were delivered by Ms Rekha Sethi, Director General, AIMA and Mr Neeraj Kapoor, Director, AIMA delivered the concluding remarks. Some of the other speakers who attended the Conference included Ms Shweta Rajpal Kohli Country Director – Government Affairs & Public Policy, India & South Asia, Salesforce, Ms Tripti Shinghal Somani Chairperson & President, Confederation of Women Entrepreneur, Dr Shikha Sharma, Founder, Dr Shikha Sharma’s Nutri Health (Special Session), Ms Nina Chatrath, Founder, Enhance Consulting, Shelly Singh, Co-Founder & Business Chief Officer, People Strong, Mr Pranjal Sharma Author, Kranti Nation: India and the Fourth, Industrial Revolution, Ms Shelly Agarwal - Management Consultant, McKinsey & Company, Ms Meena Bhatia, Vice President Marketing & Operations, Hotel Le- Meridien and Ms Vibha Dhawan, Senior Director, The Energy & Resource Institute. 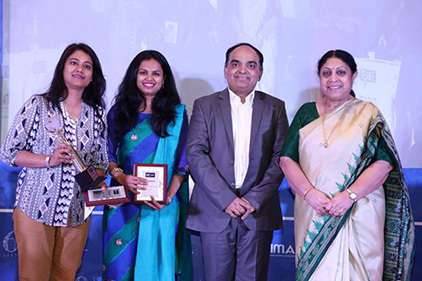 The AIMA’s special women quiz was conducted by the quiz master Mr Ajay Poonia. 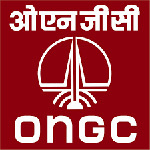 Reserve Bank of India was declared as the Champion, followed by Power Grid Corporation of India as the 1st Runners-up and Steel Authority of India as the 2nd Runners-up. The Chief Guest of the event was Ms Seema Bahuguna, Secretary, Department of Public Enterprises, Government of India. Ms Veena Swarup, Former Director HR, Engineers India limited was the conference Chairperson. Ms Shivani Wazir Pasrich, CEO SWP Productions & Renowned Actor, Dancer & TV Personality delivered the keynote address . Ms Taniya Bajaj, Senior Business Analyst, McKinsey presented a report on Gender Diversity. 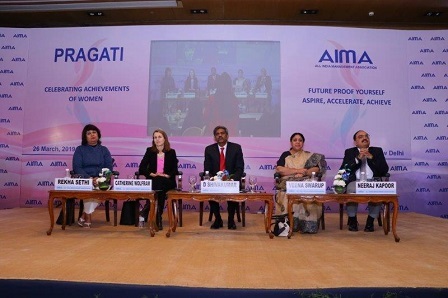 Some of the other speakers at Pragati included Dr. Aquil Busrai, CEO, Aquil Busrai Consulting; Ms Kalpana Awasthi, Director General, NPC; Ms Anita Lal Tripathi, Professor, FORE school of management; Ms Nina Chatrath, Managing Partner; Mr Pranjal Sharma, Economic Analyst & Writer; Ms Pratibha Jolly, Principal, Miranda House; Dr Shikha Sharma, MD, Nutri Health; Ms Meena Bhatia, Vice President, Marketing & Operations, Hotel Le Meridien and Ms Ester Martinez, CEO & Editor in chief, People Matters. 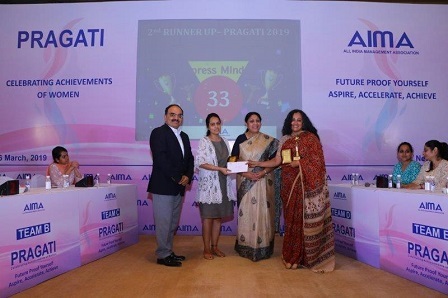 The grand finale of AIMA’s special women quiz – Pragati was also held on the occasion, conducted by the quiz masters Mr Ajay Poonia. UPES Dehradun was declared as the Champion, followed by RBI team as the 1st Runners-up and Vizag steel plant as the 2nd Runners-up.